Unlike some old myths that orchid house plants are difficult to grow, the truth is they are relatively easy to care for and grow. These will brighten your home and most will be very fragrant as well. Like any other plants in the house they need water, humidity, light and fertilizer. The most popular orchids for the home include Cattleya, and Paphiopedilum and Phalaenopsis orchids. Orchid plants are often air plants or epiphytes and have a very efficient water storage system. In general Cattleyas and need water once a week as they should be allowed to dry between watering. Whereas Phalaenopsis need to almost dry out. One way to determine this is to stick your finger into the media about 1 inch or 2 centimeters. The mediums should feel spongy and not bone dry.These may need watering twice a week. Paphiopedilums should not dry out but rather should be moist. These also will do well with more frequent watering. Lighting is next in importance for orchids in the house. All of these types need medium light and will do well. In medium light they need about 4 hours of sun a day, so sitting on a window sill or the corner of a desk would be great. Cattleya can take sun up to 6 ours and Phalaenopsis need only a few hours and it should be indirect sunlight, but all do very well in medium light. Humidity is important for these air plants. Humidity should higher than 50% and this can be easily taken care of with humidity trays. These trays are metal or plastic and filled with small pebbles. The tray is then filled 1/2 with water and the house plant sits on it. It is important not to let the orchid plant sit in the water. 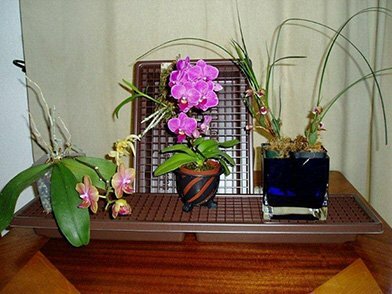 I sell orchid humidity trays that are very suited to growing orchids in your home. They are perfect for maintaining humidity around the plants and are easy to use and clean. Check out these cool trays for your house plants and orchids. When grown as house plants will need an standard fertilizer about once every couple of weeks during growing and blooming times. When they are not in active growth phase orchids can be fertilized every month or so. I do not generally fertilize at all during the winter months. The fertilizer solution should be diluted about one quarter strength of what is recommended on the label. The adage is "weakly, weekly". The fertilizer needs to be specific for orchids and a "non urea" fertilizer is better. Be careful not to over-fertilize because it can actually harm the plant. This has been a general quick overview of growing orchids in the home. If you have any questions you have pertaining to growing your orchids all you need to do is contact me. I am more than happy to try to help.